Tea is such a relaxing beverage. I love sipping on a hot cup of flavored tea at night while reading a good book. I always take my tea black with no milk or sugar. It is how I have always enjoyed my tea. I love trying new flavors of tea and often will spend time in the supermarket or specialty shops looking for new flavors. 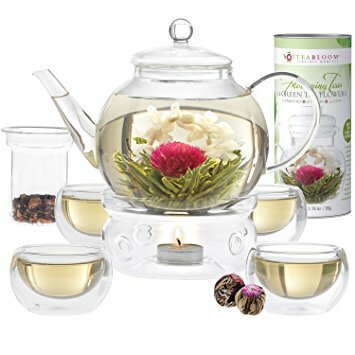 Teabloom.com is a specialty shop that specializes in all things tea related. They have a great selection of teas, including blooming tea sets which flower as they brew. They are truly beautiful to look at and to display during an afternoon tea, and perfect for a get together. They even make a beautiful gift or party favor. Have you ever tried loose tea? It is usually sold in tins to keep it fresh. For those of you who have never tried loose tea leaves, I highly recommend them. They have a fresh flavor and you can use as much or little as you would like in order to satisfy your strength preference. Teabloom carries many cups, travel mugs and even presses that are designed to be used with loose tea leaves or tea bags. They include this beautiful ECOTEA Ceramic Mug and Reusable Tea Bag Infuser set that I received which is made of ceramic and silicone. The base of the cup has a dishwasher and microwave safe silicone that is designed to protect surfaces from heat. There is no need for a coaster or plate to be placed under this cup. It also comes with a silicone teapot shaped tea bag holder that can be used told the silicone tea bag infuser that is included in the set. This set is available in 4 colors, including: red, blue, green and orange. The included tea leaf infuser is simple to use, just fill it with loose tea, place it in the mug and let it steep a few minutes. It can then be removed and placed on the tea bag tidy. You can visit Teabloom.com to learn more about this set and others. Disclosure: I received this set to review for my personal opinion. Your opinion may differ. Their flowering products are beautiful! That ECOTEA Ceramic Mug and Reusable Tea Bag Infuser is really nice too.